The St Ayles Skiff is visiting London next weekend and will be available for test rowing at Richmond Bridge (Surrey side) from 11am on Saturday 27 February. Alec Jordan, who makes the kits, will be on hand to answer questions and take cheques. I will be there to take pictures. Come along and give the boat some welly! 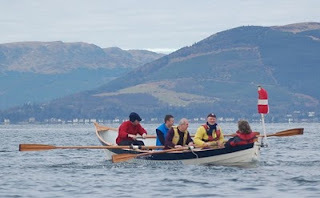 Chris O'Kinnaird was launched on the Clyde last weekend so a crew from Royal West Amateur BC in Greenock could try her out. Alec tells me rowers from Lough Foyle also turned up and he had to go out with them. "They go out once a week and I was completely knackered," he says. Here is a great video of the Irish getting an impressive speed up. Note the almost complete absence of wake.